Well, we all saw it coming. Online prices for Nintendo’s Super Nintendo Classic Edition are already out of control. Just give up hope now. Life is short. Retailers in the US currently have landing pages for pre-orders, but Americans can’t technically reserve one yet. Pre-orders did go live in the UK yesterday and they have already sold out. Now those reserved units are up for sale on eBay and the markup is astronomical. One eBay user sold their console for $389.99. The $250 to $300 range seems to be fairly standard for second-hand purchases of the system that retails for $80. Don’t do this. It’s really not worth it. Is the SNES Classic cool? Yes. It seems great, and for $80 bucks it’s not a bad deal. The games are way better than the ones that were offered on the NES Classic, and Nintendo even threw in a complete version of the previously unavailable Star Fox 2. Another game that comes with the system, Earthbound, can go for close to $300 if you’re looking for an original cartridge. And yes, you can play all of those games (except complete Star Fox 2) and more through ROMs, but the experience is usually buggy and it’s illegal. This is a nice, clean, nostalgia box with an HDMI port. But it’s a fetish item. If you have this particular fetish, there will be no persuading you to avoid feeding this madness. You want that box and if you have the dough, you’re going to pay. Godspeed. Is it a good investment? For these resellers making a quick buck, it is. Nintendo sold 2.3 million units of the NES Classic and just stopped selling it. There was still demand, and Nintendo could have manufactured more. Instead, it’s now a collector’s item that sells for about the same price as it was going for at its peak. One day that price will undoubtedly rise but 2.3 million units is a far cry from qualifying as rare. For people who just want to play the games, chill. You know what you can buy for $300? A Nintendo Switch. And that’s really what Nintendo wants you to buy. These mini-consoles are bringing back the warmth of the brand. The Wii U had its detractors and Nintendo is reminding people why this company matters. 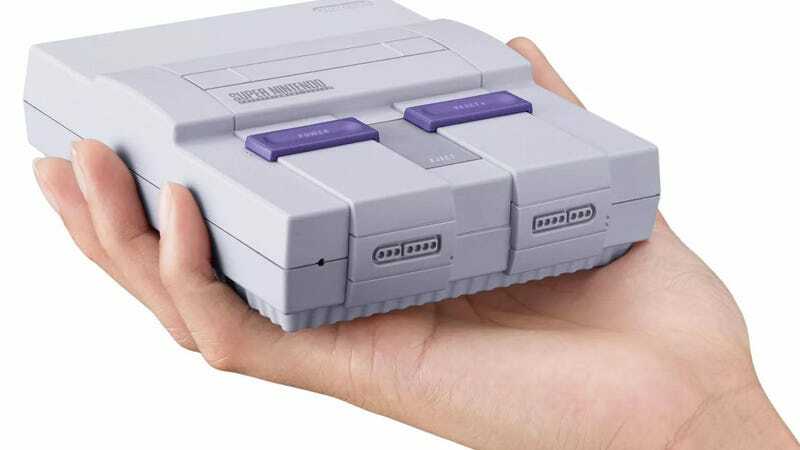 There’s virtually no doubt that the SNES Classic will be discontinued and some option to play retro games will be available on the Switch. There might be a revived Virtual Console or you might just get them through the already announced subscription service. Buy this SNES-style controller for the Switch and you will be good to go. Suddenly, you’ll have a portable SNES Classic that can also play the new Zelda. Also, I don’t want you fools buying up all the units and preventing me from getting one.